As any true cosmetics devotee knows, makeup thrills can happen at any kind of retail location, on every price level. Sometimes it’s a pleasure to “cave” on a hard-to-find product with luxurious packaging and a designer logo, and sometimes the “aha!” moment comes from an impulse purchase at the drugstore. Annie and Cavewoman have always inspired me to look high and low for rave-worthy makeup, so I’m happy to be able to report back to Blogdorf about Essence Cosmetics. 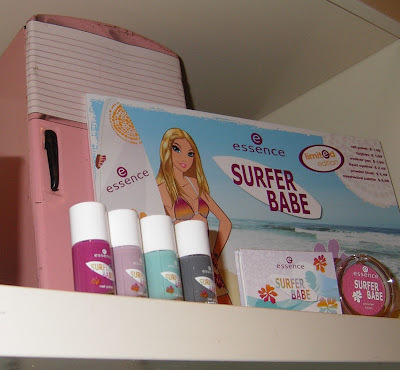 Essence’s product displays are definitely eye-catching: they’re crammed with all the colors of the rainbow, and they’re decorated with big pictures of Bratz-like girls. Once you look past the bright colors and cartoony imagery, however, you’ll notice some very clever,high-performing products. The selection being brought to the States—it’s being sold at Ulta stores and Ulta.com--includes color cosmetics for eyes, lips, and face, nail polishes and nail art accessories, and a few makeup tools. The first limited edition collection to be released in the States will be “Surfer Babe,” due out in June. I’ve had the chance to sample a few products, so I’ll be back in a few days with reviews of my favorite picks from Essence Cosmetics. Have you ever tried anything from Essence? Feel free to comment! The essence Surfer Babe nail colors look bomb! Essence's eyeshadows are crap (at least the ones I tried so far, so I assume all of them), but their nail polishes are quite good! I'm not a naildoer, so I don't know how the stickers, stamps, and other nail styler stuffs perform, but for the price who the hell cares!? It worths every penny! Loveless, Aren't they nice? Wait until you see the inside of that Surfer Babe palette, too! I've used the nail polishes, they are really good quality, great colors, and of course the price cannot be beat! The Stampy set for nails is also a winner. Mary, I'm sad that we missed the Moonlight collection! So pretty. Chicadee, I'm intrigued by that nail stamp set! soooooooooo... where can we find these goodies? I can't wait to play with them!! I love the color of the 2nd nail polish from the lft on that bottom pic! I absolutely love this display! The cupcakes made me hungry haha! I wouldn't know what to choose first, everything looks fantastic! JoElla, it's all available at Ulta, in-store and on-line! Firefly, it's a very pretty lavender; the permanent line has a nice lavender, too. Lynsey, they're such pretty cupcakes, and they almost match some of the makeup! I assume all of them), but their nail polishes are quite good! I'm not a naildoer, so I don't know how the stickers, stamps, and other nail styler stuffs perform, but for the price who the hell cares!? It worths every penny!